Three years after Persona 4: Dancing All Night, Atlus is back and not with a sequel, but two of them in one go! Persona Dancing: Endless Night Collection is basically both Persona 3: Dancing in Moonlight and Persona 5: Dancing in Starlight, both previously released first in Japan this may. 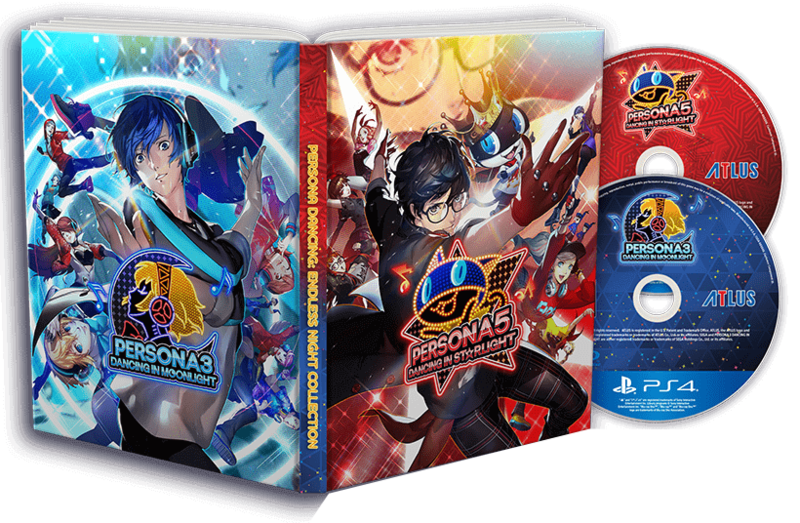 Sold together on PlayStation 4 and VITA for the West, the two title also come with an extra bonus of Persona 4: Dancing All Night, making it the ultimate treat for fans of the series this holiday season. But with a different take on the brand than the usual RPG recipe, will this experience appeal to everyone? When Persona Dancing: Endless Night Collection, P-Studio managed to do things differently from Persona 4: Dancing All Night days, and in a good way. In each of Persona 3: Dancing in Moonlight and Persona 5: Dancing in Starlight, our iconic heroes are all brought to the Velvet Room, a place that fans usually visit as the protagonist, now transformed into a huge dance floor hosted by either Elizabeth (Persona 3) or the Caroline and Justine pair (Persona 5). They explain that there’s a sort of rivalry between each dance floor, and it’s up to you to defeat the opposing team. In any case, it’s a goofy storyline that is more of a context for the numerous dance routine to challenge throughout the game. The game directly tosses you into the groove, when you have to finish a series of challenges, which unlock new interactions between characters. Their “discussions” are more on the fan-service side, as they don’t really expand much on the storyline, and might not be enough meat on the bone for non-Persona fans. Nevertheless, the personalities of each character were perfectly respected in the game, especially for me rediscovering Persona 3 almost 10 years after the original game release. Plus there’s also the goodies that you’ll enjoy if you’re a fan of the core franchise, with an insane amount of costume and accessories to dress up your dancers, which can be unlocked thanks to your prowess in the game instead of succumbing to microtransactions. In terms of gameplay expect the same core basics as Persona 4: Dancing All Night. Closer to the core gameplay mechanics of Project Diva in comparison to let’s say a Guitar Hero or Just Dance, you perform your dance moves by pressing the right 6 buttons that is synced with the beat. Each of these buttons matches those of your controller, split into top/left/down arrows on the left side of the screen, and Triangle/Circle/Cross on the other side in a half-moon position around the screen. Button scroll so quickly, and it’s up to you to press them at the right moment, with some instances where multiple “notes” need to be pushed at the same time, to hopefully maximize your total score. Unfortunately, there is no novelty when compared with Persona 4: Dancing All Night, but why fix something that isn’t broken? The beauty about the game though is its music and the mood that comes with it especially in terms of animation. As you dance, you’ll realize how much effort was made into the sets, special effects, and choreography of each character. However, the major change that these new titles bring to the series is its level of difficulty. When I compare my experience with Persona 4: Dancing All Night, Persona Dancing: Endless Night Collection made me pull my hair in some of the songs, especially when you can activate unlockable modifiers. As you would assume, while the modifiers increase your final score, they add difficulties to the game, which is a high gamble in some songs. In the end, Persona Dancing: Endless Night Collection is exactly what fans of the series would love as they wait for the upcoming major Persona title. Whether you’re a fan of either Persona 3, 4 or 5, this game will play on your love of the franchise, its music, and characters. with a playability that is both easy to handle and difficult to master. Persona Dancing: Endless Night Collection was reviewed using a PlayStation 4 digital download code of the game provided by Atlus. The game was is also available on PlayStation Vita via digital and retail store releases. We don’t discuss review scores with publishers or developers prior to the review being published (click here for more information about our review policy).